Personal best in fishing doesn’t always have to mean personal biggest. 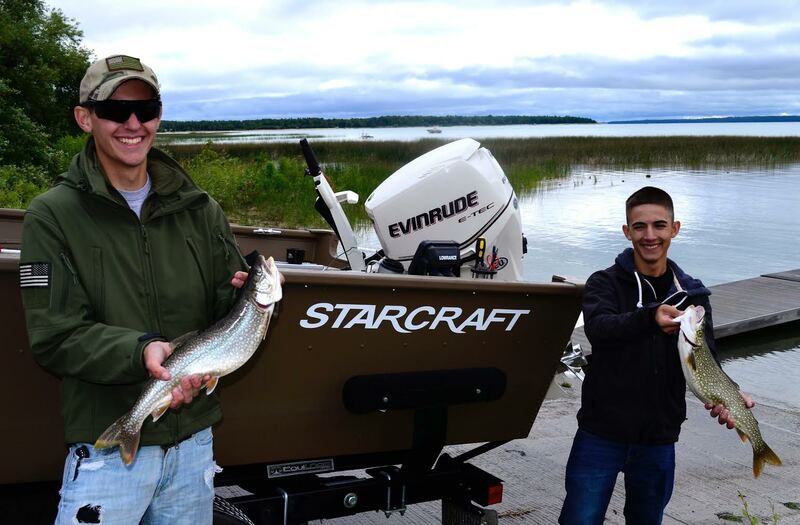 These modest lake trout have a deeper personal meaning for the author. In the world of sport fishing, anglers are always talking about their “personal best” catch. No doubt when an angler catches an especially noteworthy fish, that memory is going to live on as long as the angler! I know in my case, I can remember the details of countless fishing trips like they happened yesterday. One of the coolest things about fishing is that no matter what your personal best might be, there is always a chance to improve upon that fish. That’s the drive that keeps a lot of us self proclaimed “fishing nuts” coming back again and again. While there is no guarantee that each trip will produce another personal best catch, just knowing it could happen is enough to make sure we keep some skin in the game. Over the years I’ve come to the conclusion that “personal best” doesn’t have to mean “personal biggest”. Sometimes the situations in which a fish is caught are more meaningful than the size of the fish. For example, some years ago my Dad drove up from his retirement home in South Carolina to spend a little time with my family. It’s noteworthy that my Dad wasn’t much of a fisherman, but he did take us kids fishing when we were little. My childhood memories of fishing with my Dad usually focus on Dad reading the newspaper in the boat, while my brother Mike and I beat the water to a froth in hopes of catching something. When Dad arrived, we made plans to take him fishing with my two sons Jake and Zack. At the time the fishing on Houghton Lake was pretty good, so we opted to spend a few hours trolling for some walleye. I’ve fished on Houghton Lake countless times, but never before and never since I have witnessed anything like the day Dad, the boys and I fished together. It was like we could do no wrong. Fish after fish hit our crankbaits. We had a four man limit of walleye in the boat before noon, but the number of fish we caught wasn’t the most memorial part of the trip. This was the first time my Dad had fished with me as an adult. Somewhere between college, a career and raising a family I had not found the time to go fishing with my Dad. That day of fishing, the fish fry that followed and the memories created rate as a “personal best” for me despite the fact I’ve caught more and bigger walleye lots of times. Another “personal best” happened to me and I didn’t even catch the fish! We were fishing and filming a TV episode in Ontario. 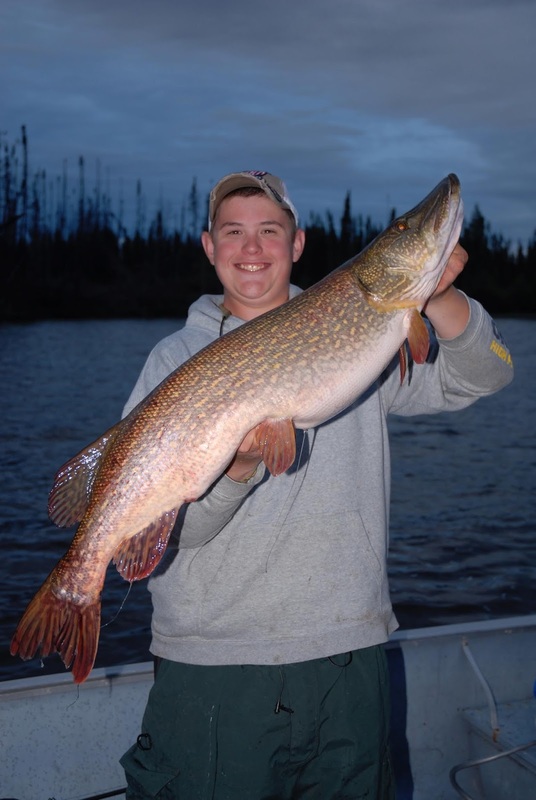 At the time Jake my youngest son had been on several fly-in fishing adventures, but despite considerable effort had not yet caught a noteworthy northern pike. To make matters worse, Jake for one reason or another has enjoyed a ring side seat watching me catch dozens of pike over 40 inches. On this particular trip the boats were small so I was fishing and filming with a friend and Jake was fishing by himself in a second boat a couple hundred yards away. We heard Jake yell out and we could see he was fighting a fish. We raced over just in time to help him net a massive northern pike. The whole process was captured on video, making the event another “personal best” despite the fact I didn’t catch the fish. We took a few photos and Jake released that trophy pike. The bait he caught it on -- all chewed up and nearly paint free -- still hangs on the bulletin board in Jake’s room. Another personal best occurred when my oldest son Zack came home from the Army on leave. His high school buddy Jon who was serving in the Marines timed his leave for the same weekend. 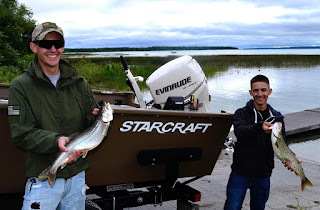 I arranged to take both of these enlisted men fishing on Grand Traverse Bay for some lake trout jigging. As luck would have it the water was pretty rough, but everyone caught a few trout before we got blown off. The late morning breakfast we all enjoyed sticks in my memory as the moment in time I started seeing my oldest son as an adult. My point in all of this dribble is that as outdoorsmen and women we fish because of the adventure it provides. We measure those adventures often times in the number of fish or the size of fish we catch. The older I get, the more I realize that “going fishing” is the reason we justify the boats, motors, electronics, rods, reels, tackle, etc. The real truth is that fishing is actually just an excuse to spend more time with the people we care about. That’s my story and I’m sticking to it.